All these Screen Printing film is made of PET material, Transparent, Waterproof, Instant dry. It is professionally used for positive screen printing, plate making, and silk screen printing. Suit for Dye and Pigment inks, support Epson, Canon, HP Printers etc. The Inkjet Screen Printing Film can do black, white and color print of plate-making in aspects of newspapers, books, screen, trademarks and textile printing. Each roll with individul packing, with end cap two side. We understand that it's most important to care about the requirements of clients according to clients' markets. We are always focusing more on it. We can do it well as always. We hope that we can accompany with clients together for further developing. 1, Do you have Inkjet screen printing film that suit for Pigment inks? 2, Do you have non- waterproof Inkjet screen printing film? 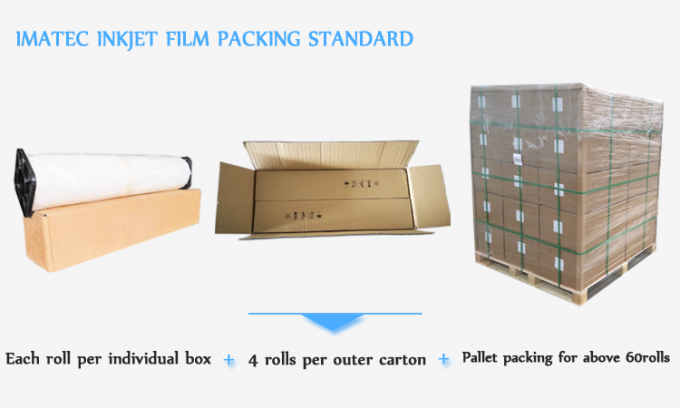 - Yes, we have both waterproof and non-waterproof Inkjet screen film. The non-waterproof inkjet film is for pigment and dye inks, with transparency. 3, Can I have samples before place an order? - Yes, sure! We provide Samples in both A4 size and Roll size (normally 24" *3 Meters). All these samples are FREE for testing.